Two(2) Dynorun tests were conducted on 03/10/2015 at JC Racing Sdn Bhd in Bandar Sunway. The objective of the Dyno tests were to find out and to compare the horsepower and torque of two types of engine lubricant oil. In the first dynorun test, we used our RTR Engine Treatment Booster Oil to be mixed with a branded mineral based engine oil of high viscosity which is Shell Helix HX3 20W-50. 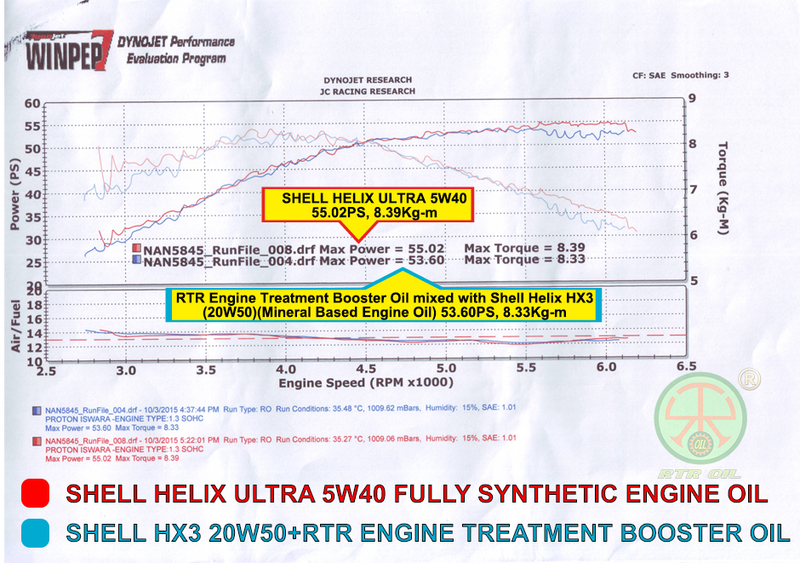 And in the second dynorun test, we used Shell Helix Ultra 5W-40 fully synthetic engine oil. In the video shown above, we noticed and heard the noises the engine generated were different. In the first dynorun session, the engine that was using RTR Engine Treatment Booster Oil was running quieter at the engine speed of 6100rpm, and we are very sure that it can still accelerate to a higher engine speed than this one. In the second dynorun session, the engine was using Fully Synthetic Engine Oil. From the video we can hear that the engine has reached its peak stress level at around the engine speed of 6200rpm. Let’s go to the dynorun result, RTR Engine Treatment Booster Oil mixed with common mineral based Shell Helix HX3 Engine Oil produced 53.60PS horsepower, and 8.33Kg-m of torque. While on the other hand, Shell Helix Ultra fully synthetic engine oil produced 55.02PS horsepower, and 8.39Kg-m of torque. The horsepower difference is very minimal which is equivalent to 1.42PS, and the torque difference is 0.06Kg-m. The dynorun result is astonishing. We only lost by a very narrow margin in the first two session. The results of the two dyno run are shown in the dynograph. 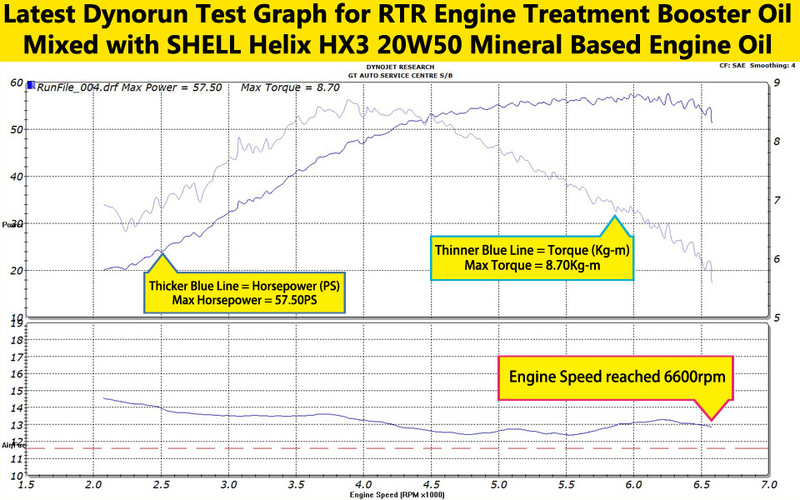 The mixture of RTR Engine Treatment Booster Oil and Shell Helix HX3 20W-50 mineral based engine oil is represented by the dark blue line on the graph, whilst SHELL Helix Ultra 5W-40 fully synthetic engine oil is represented by the red line on the graph below. We were quite happy about the result, but not very satisfied with it, because based on the engine noise generated during the first dynorun session(The one using RTR Engine Treatment Booster Oil mixed with SHELL HELIX HX3 Mineral Based Engine Oil), it has not reached its peak stress level yet. Therefore, we made another trip to Bandar Sunway a week later. 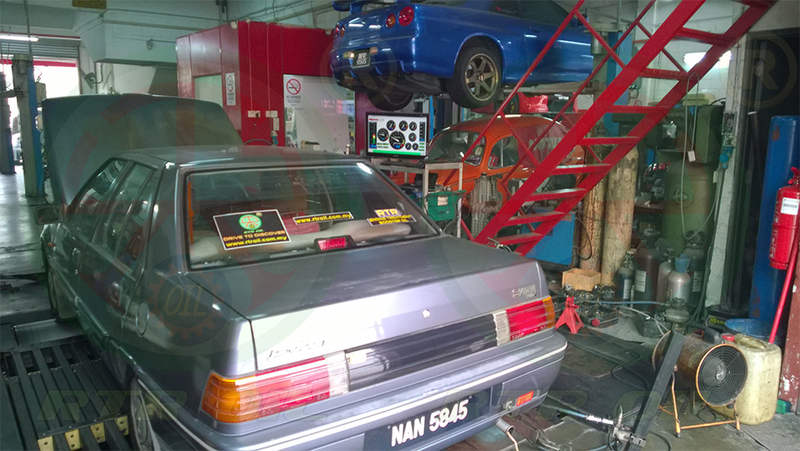 This time we went to another famous car tuner workshop, GT AUTO Service Centre Sdn Bhd to do another dynorun session. Before making this trip to Bandar Sunway, we have drained out the SHELL HELIX Ultra Fully Synthetic Oil, and changed to Shell Helix HX3 20W50 mineral based engine oil mixed with a bottle of RTR Engine Treatment Booster Oil. As shown in the dynograph above, this time the engine speed reaches 6600rpm and produced 57.50PS horsepower and 8.70Kg-m of torque. Compared to the previous two sessions, this is a breakthrough result for us. 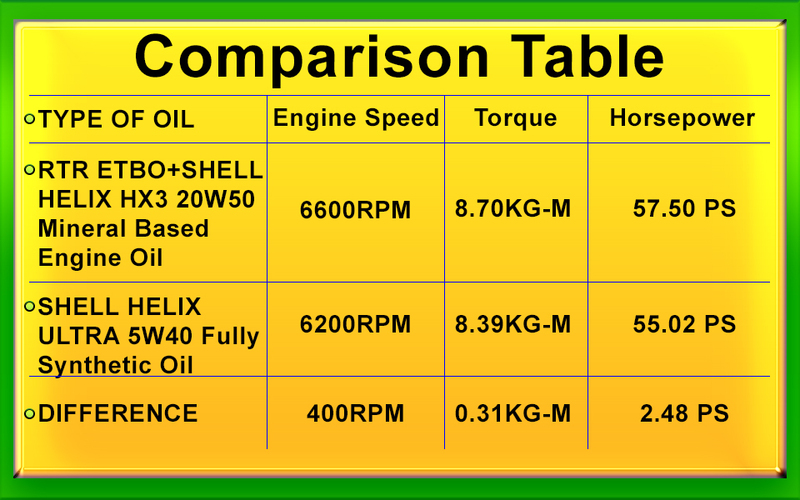 Let’s do the math; the engine using RTR Engine Treatment Booster Oil together with Shell mineral based engine oil has produced 2.48PS more horsepower and 0.31Kg-m more torque as compared to the Shell HELIX Ultra 5W40 Fully Synthetic Engine Oil. Last but not least, dynorun test is a great way to prove and to compare the effectiveness in reducing friction between the moving parts, increasing engine performance by providing top notch engine protection, and to show the engine performance in term of horsepower and torque in the form of numbers and graphs. We have successfully proved that only by adding RTR Engine Treatment Booster Oil to any common mineral based engine oil, it can definitely improve the engine performance that is comparable or better than branded fully synthetic engine oil in terms of horsepower and torque. Imagine that if it is added to higher grades engine oil such as semi-synthetic engine oil and 15W40 mineral based engine oil, just imagine the improvements in performance it could bring to your engine. So What Are You Waiting For??? Get it now and DRIVE TO DISCOVER, and LET THE PERFORMANCE SPEAKS FOR ITSELF. Experience Our REJUVENATION ENGINEERING™ Technology NOW.